We” engrave a single piece to short production runs. Have a glass gift item you would like personalized with text or perhaps a graphic or logo? laser engraving should be your first choice. Why? It’s affordable and can be very detailed, much more than sand blasting or rotary engraving can achieve. That said, nearly any file on your computer or hard copy that will fit in a standard scanner can be used for engraving. There are a few limitations though. The engraving is low contrast, the glass turns white where the laser engraves, there is no real shading so continuous tone images, like a photograph, don’t work well. But a logo, text, clip art and many graphics work great. When it comes to laser engraving glass, cheaper glass is better. Laser engraving doesn’t really engrave the glass. What’s happening is the laser is effecting the imperfections (air bubbles, moisture, etc. ), and so cheaper glass engraved better that expensive glass. 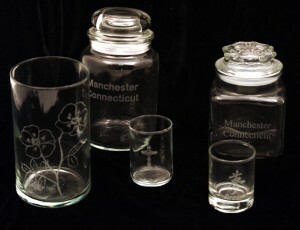 Glass containing medals like leaded glass can not be laser engraved because our laser does not engrave medals. The thinner the glass the greater the chance the glass may crack or shatter. It is better to include a couple extra pieces,just in case. We can engrave flat glass up to 17×29 inches with an engraving area of 12×24 inches centered in the peice. 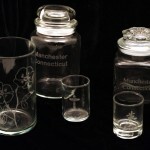 We can do cylindrical glass ( glasses, mugs, vases) from 2 inches to 7 inches in diameter and to about 16 inches in length. The resolution of an image matters. You can not take an image that is for example 72DPI and make it 250DPI and improve the resolution. You need to start with the higher resolution to get good results from the laser engraving. Most images on the web are 72DPI. If you look at your business card or letter head the logo looks good. But take a look with a magnifying glass or try to copy it and the low resolution and the fibers effect the quality of the scanned image. The original art work is always the best, either a digital file or a high quality image for us to scan in on glossy paper, full size or larger ( detail and quality may suffer if we need to enlarge the image) and a resolution of at least 250 DPI. Often I’m asked “can you put this image or logo on this item for me?” with a link to a web site or an attachment to the E-mail. If it’s not your own work or image and you are not connected with the other party, you can not use their images without permission. If I’m not sure I will ask the customer to provide proof they have permission to use an image, logo or artwork. Images in print, broadcast, or on the web are copyright protected even if it isn’t stated. There are sites where you can down load images for personal use only. That means you can not use the image on something you are selling. As a business owner I can not use someone else’s Images from print, broadcast, or on the web for you and profit from it. There are severe fines, penalties and possible jail time for copyright infringement. That’s just the law; that’s how it is.